Iran’s daily Javan newspaper, believed to be close to the hard-line Revolutionary Guard, said that replacing Tillerson with CIA director Mike Pompeo signaled the end of the nuclear deal. President Donald Trump’s appointment of Pompeo places an ardent foe of the deal in charge of U.S. diplomacy as the administration debates whether to withdraw from the agreement. 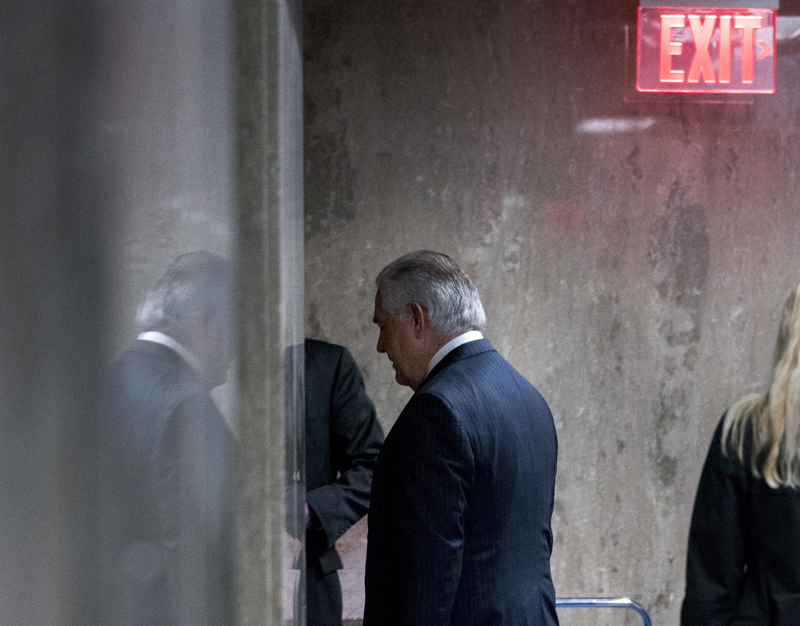 Tillerson had pushed Trump to remain, and had been pursuing a delicate strategy with European allies and others to try to improve or augment the Obama-era deal. “For quitting the deal, his dumping was necessary,” Javan said. That was echoed by Ali Khorram, a former Iranian envoy to the United Nations, in the pro-reform daily newspaper Arman. Iranian Foreign Ministry spokesman Bahram Ghasemi, meanwhile, sought to minimize Tillerson’s firing, calling it part of the “frequent and multiple” changes in Trump’s administration. Tillerson’s firing was welcome news for Saudi Arabia and the United Arab Emirates, which view Iran as a regional menace. They have also pushed Washington to take a harder line on Qatar, which they and other Arab nations have boycotted since last year, accusing it of supporting extremist groups and cozying up to Iran. Tillerson had sought to mediate the crisis among the U.S. allies. In the UAE on Wednesday, the English-language Khaleej Times borrowed from the U.S. president’s show-biz days for its headline: “YOU’RE FIRED!” Saudi Arabia’s English-language Arab News had the same headline. Another English-language newspaper, the state-aligned The National newspaper of Abu Dhabi, offered an editorial saying Tillerson’s firing would “surprise few,” pointing to his disagreement with Trump over Qatar. The UAE, along with Bahrain, Egypt and Saudi Arabia, cut off land, sea and air routes to Qatar in June 2017. Qatar, which has backed Islamist opposition groups like the Muslim Brotherhood, has denied supporting extremists. It shares a massive offshore natural gas field with Tehran. Trump has at times appeared to side with Qatar’s rivals in the dispute, while Tillerson had projected a more neutral stance. “While Mr. Tillerson shortsightedly urged Saudi Arabia and allies in the quartet to end their boycott of Qatar, Mr. Trump named Doha ‘a funder of terrorism at a very high level,'” The National’s editorial page said. Abdulkhaleq Abdulla, a prominent Emirati professor of political science, called Tillerson “the worst foreign minister in the history of America” on Twitter. He also implied Gulf Arab unhappiness with Tillerson led to his ouster. “History will remember that a Gulf state had a role in expelling the foreign minister of a superpower and that’s just the tip of the iceberg,” he wrote. Kuwait, which has sought to broker an end to the Qatar crisis, offered no immediate comment, though a local newspaper described Tillerson’s departure as striking “like an earthquake” in a headline. Associated Press writers Nasser Karimi in Tehran, Iran, Hussain al-Qatari in Kuwait City and Jon Gambrell in Dubai, United Arab Emirates, contributed to this report.